Well said.. In Australia most of us are taught at an early age, how to survive... We have a wild country with Floods, Bush-fires and droughts to live through. The wise always listen and learn. I often thought of Australia as the spiritual home of bushcraft,maybe one day I'll get to visit! Thanks for following Susie, it'snice to have you on board. Hello, I just came across your site. I am not sure what to make of this post. I am from northern Ireland myself and I belive we should all be supporting any local business no matter what they do. If someone can sell something it is because someone is willing to buy it. To post something like this which slags off local business for giving people what they ask for is an absolute disgrace. I am not sure how many people read your blog but lets hope that they take what you said with a pinch of salt because who knows what damage you could have done to peoples business and incomes with stupid immature comments like that. By the way I dont think you will publish this comment but hopefully you will see sense and wise up a bit. Trev, (welcome aboard by the way) I wasn't refering to individual Businesses ,if you read my post carefully you will see I'm referring to "weekend warriors", a recognised term used often on BCUK, Bushcraftliving and NaturalBushcraft to describe this sort of individual,those who have a full time job but try to cash in on the bushcraft boom by running courses on the weekends when they have no great expertise in such, when they have not researched the subject properly,when they have not widely travelled and only commit themselves to showing the same old basics again and again for the sake of the almighty dollar..If you think local businesses will be deprived because of one paragraph I have written on my blog (when the post was dedicated to Dave Canterbury more than anything else)then you credit me with much more clout than I actually have and I am very flattered,thankyou...Do you run a local Bushcraft school? I would be very interested in hearing more about you and why you are so vehement with regard to a simple opinion, please do get in touch again. Hi there I can see where you are both coming from. Financially I make a loss in my instruction of tracking. Shadowhawk whom I instruct for charges money; I fly south from Scotland, instruct and fly home. I am about £200 out of pocket per trip. I do it for the love of tracking and seeing people learn about tracking. It does not bother me that Shadowhawk charges. 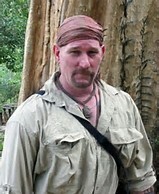 As to having a paid job, instructing bushcraft would not make you a survivable income. What I appreciate from your post is its dedication to guys like DC, he deserves recognition. I also believe without the profit made by guys like RM that we would not have as good programs available on DVD to buy or gear to buy as they do the testing. I wonder how many axes he spent his cash on before he finalised on gransfors and would we have hultafors or Roselli available if the market had not been initiated. Switching thoughts again I do agree that there are a lot of pretenders out there. On every course someone proclaims to me that they are an instructor or that they have been special forces. I used to be impressed now I try not to yawn. That's a very balanced view Hawkeye, thankyou.The fact that you make a loss at what you do but still do it for the pure love and passion of it shows the value of your integrity,and it's that (like Dave Canterbury)that truely impresses me, the post was simply aimed at those who have no real knowledge stealing customers from tried and tested quality bushcraft schools. You may have more clout then you realised. Northern Ireland is a small country after all. I've received a whole flood of e-mails pointing to your blog after your message. I think people interpret your message as saying that you feel all groups/schools in Northern Ireland are terrible. Perhaps it depends from what angle you're reading it, but I don't think you're trying to say that all bushcraft teachers in Northern Ireland are terrible. you mention that there are 7 groups you can think of that charge people for basic outdoor knowledge. you don't mention that these groups offer bad quality per sé. Furthermore, it may also be that you know 9 groups, of which 7 offer basic skills only. In some ways you're right with your point that a course is not necessary. I agree with you that it's quite possible to learn basic skills for free. The knowledge is available anywhere now. There's thousands of video's on YouTube for instance, showing you how a friction fire is lit. Strictly speaking, with the right attitude, determination and discipline, there's absolutely no need to attend a course. 2) A course allows you to receive corrections when you're doing things wrong or receive encouragement you mightn't get when studying alone. As such, a course can take a lot of the learning curve away, and speed up the process of mastering a skill. It's always great to have an experienced person alongside you when doing things you've never done before. 3) it's an opportunity to share time with like-minded individuals (and introduce you to new, potential, friends). Sitting around a fire, swapping war-stories, etc. The fact there's a schedule also means that you know you will be doing stuff, while when studying alone, it's easy to "give up" at a certain point, and go home. 4) In most cases, there's trained help available should anything go wrong. 5) All materials and tools required are provided for, cutting out a lot of the hassle and frustration gathering equipment and/or materials for a particular activity. To be clear, I cannot speak for other groups, and I am not saying that participants of courses always receive the above mentioned benefits. What I'm saying is that people book on a course because they perceive the above benefits. People sometimes also go to courses as a form of a "magic pill" to learning difficult skills. And in many cases, they do not leave disappointed, as an experienced instructor, can really help people past sticky points on the learning curve. "I've been trying my hands at these skills for years, but wasn't getting any further, that's why I joined the course"
"I've been struggling for a long time with X, Y or Z, but what you showed me made all the difference"
"Just seeing someone do it in front of me was really good for my understanding. I never 'got' that from reading books or watching YouTube videos." It's true that your blog post could be seen as an attack on groups teaching skills, but as I wrote above it's a matter of interpretation. I do think though, that ambiguous posts like this can create a climate of tension and distrust in a small bushcraft community like the one present in Northern Ireland. How many of these schools / groups never communicate with each other? How much could they achieve organising things together? When we look at the Republic for instance, you see no tensions there like here in the North. It is a joy to participate in events down South. I think every individual reader of this blog is different, and as such will make their own choices whether or not they'd like to attend a course or trust a Northern Irish group to deliver upon their promises. One thing that I do strongly depute though, is the way you imply that anyone who happens to work full-time and teaches during the weekend is just after the money or has little experience in the skills that (s)he teaches. Who gets to make that judgement? Would such an individual be teaching full-time if he could afford it? Does he have a deep mastery of the skills he teaches? How would the current financial climate affect the ability of any school/individual to operate full-time? Perhaps they were full-time in the past? Perhaps due to supply/demand, they only offer basics through their school/group? I know plenty of fire-fighters and paramedics who only work "during the weekend" does that make them weekend-warriors too? After a quick buck? As a more "bushcraft-related" example. I know Mors Kochanski reasonably well. He worked part-time for many years! Would anybody dispute his skill? Very nice blog, I'll definitely keep checking back! Anthonio, nice of you to drop by, If you're the Anthonio I'm thinking off then I have actually attended your courses myself. So how do I go about answering all those points, well I could try but I'd be typing for days, It's funny how people pick things out of context to suit their point of view, especially when the post was dedicated to DC and the weekend warrior thing was just an opinion by myself..The whole thing actually came about when we were out practising and a friend got a text to say 2 new schools had started up and just started advertising this month..I wondered why and believe it is simply because people are trying to cash in on the bushcraft boom.I mean Northern Ireland is a small place,is there really that much interest in Wilderness Living Skills that we need 7 (if not more that I don't know about) schools to cope with the influx? Hardly. The idea that people who teach/instruct/demonstrate on weekends are somewhat less capable or less experienced was not what I was trying to portray, my posts mention those who have little experience showing the same basic skills again and again simply because they do not know anything else or have not practised extensively or are not widely travelled, those were the ones I was targeting. I could name names but I feel that defeats the point. One should evaluate oneself and genuinely believe that you have the requisite skills before you demonstrate and especially before you ask for payment. I personally have been offered payment on more than one occasion to "instruct" but refused it simply because I do not feel in myself that I am qualified to instruct,yet I do it as an occupation! I am my own worst critic, in saying that I do believe that myself and those other friends closely associated with Buzzard are very capable and probably more knowledgable than some and more than able to teach. I (and other close friends) have been to a number of these "schools" and found the instructors (how do I say this carefully?) not up to scratch, and on more than one occasion completely in error! On the opposite side of the coin there are in NI people who instruct and who genuinely have a passion for what they do and that is palpable when you meet with these people (again it would be wrong of me to name names) and that is what I respect, however the payment thing does bother me I will confess. If you have a full time job already why seek the arms of mammon? Why not leave it so that those who run Schools full time get the participants they need to survive. ..Divided we fall..no one wins! I love learning new skills and love learning from capable teachers and the bond of friendship that that creates is wonderful especially with people of a similar brood but yes, for me, payment sours that..sorry but that's how I feel. Should skills be shared for nothing? well, if teaching wilderness living skills is not your full time occupation and you don't use it as your main source of income and you have very little outlay and you aren't that experienced then yes absolutely, the skills should be shared for nothing!! If teaching wilderness living skills is your main source of income,if you have a large outlay and are very experienced and widely travelled then no, you should charge, but then if you are all these things then you're not a weekend warrior! Some have said that the love of money is the root of all evil- Now I wouldn't go that far but I would ask each instructor to examine their own conscience and if they feel justified in what they do then fair play to them, as for me I have a clear conscience and if I have a skill that someone wants to learn,they only have to ask and I will show them - for free. I agree with most of your writing. It'd be nice if you'd be willing to get in touch. I think there's good points in many of the angles written, and I would love to discuss them further. Truly! I think it would benefit the bushcraft community here in NI to iron out any mis-understandings and create an atmosphere such as we can see in the Republic as well as the South. You know where to reach me. But whether or not you get in touch, I do wish you the very best. You have a nice blog going here, and I hope you manage to keep it up! Thank you for getting in touch "off forum". It's great to compare thoughts and ideas, and to see what we as individuals can do to help the community thrive! My pleasure,I sincerely hope we can start to build bridges, looking forward to your response. Thank you for this website, Its very nice and very educational! Thanks for you comment John, it's really appreciated. Well said mate, he is a true inspiration. We have had many a chat about people calling themselves so called expert bushcraft instructors and you know my views on them people, I'm just glad that you and I have stuck to our morals an always will. We also know a couple of so called instructors who wouldn't be fit to tie our boot laces, I just find it sad that people are trying to make a quick buck when the knowledge was passed on for nothing to them from ansestor to ansestor. We can hold our heads high mate when we know we're not one of them. I am glad to see you kept my comment and thanks for the response. I actually like your blog. I said what I said because I constantly see people from Northern Ireland not supporting our local business and having spent the week promoting local business here I saw a bit of red when I saw your post. So I apologise if my reaction seemed strong. I see from a later comment from one of your readers that there is obviously some history which i dont know anything about. I dont run a bushcraft school, I am just a student like everyone else. Thanks for the response, as I said if it was a genuine dedicated bushcraft business then I'm all for it especially in NI, and I will support it totally, if it's simply using bushcraft to get money and seek some sort of recognition or ego stroking (and in turn prevent real bushcraft schools from obtaining participants that they need to survive) then that is not on,I mean how could any genuine lover of the outdoors endorse that?? DC doesn't need to put vids on you tube for free he could be out running courses and charging a fortune but he doesn't and Hawkeye doesn't need to loose £200 per each course he instructs on, but what they both have in common is a pure and refined love for what they do and that is what I have the greatest respect for, and long may that continue,they are purists and it's what I think all true bushcrafters should aspire to be..As far as the "history" you mention I'm not really sure what that means, all true lovers of the outdoors are blood brothers and all should support and encourage each other,and anyone who's path the Buzzard group have crossed are considered brothers if they share the same respect for the wild as we do (remember the Red Valerian post?) I also find your use of the word "Student" highly significant..thanks for taking the time and good luck with all your future events, come and visit when you can. These comments are becoming essays. I understand where you are coming from. I work in marketing myself and have just returned from a rather stressful job at a top pr company in London (the old ticker was starting to protest a bit). I have taken a notion to get back to nature. I know the videos you are talking about and the associated company. Sorry, but I must disagree with you on some points. The guy you are talking about does post a lot of videos but they are in real terms advertisements, whether or not he is aware of it or not. They are informal, filled with useful info and good but they are simply a way to get free advertising all be it in a more subversive way by raising the profile. I would nearly guarantee that when students book on a course there is a box on the form which asks, where did you hear about us and Youtube will be one of the options. This is excellent marketing. The first thing we told our clients when launching a business was to take full advantage of Youtube –free, twitter-free- facebook-free, before they even thought about paying for something. He also took part in the dual survivor series, surely you don’t think he did it for free? A large well known supermarket in the uk run all sorts of charity events and things but you have to ask yourself why? To raise the profile of course. I really enjoy Dave Canterbury’s videos too but we must remember that he is the head of a large organisation with many employees and quite a bit of merchandise too. There is nothing wrong with this. He is simply running a very good business and I for one support innovators in any field. "history"- i got it from the comment from Mouldy above mine which said "We also know a couple of so called instructors who wouldn't be fit to tie our boot laces, I just find it sad that people are trying to make a quick buck when the knowledge was passed on for nothing to them from ansestor to ansestor." If it doesn’t suggest history I must be missing something and I worked with some of the biggest sharks in London for years. Anyway, if you will take some advice from an old boy like me with lots of enemies, its allways better to let bygones be bygones if at all possible. Hate in your heart will consume you too. Lastly- I dont know what you mean about the student of bushcraft comment, sorry. Live long and proper my friend. Love the blog man. Yeah, Dave is great ain't he. All those free videos; why do I pay a TV licence! I agree, the 5C's are a great way to begin any kit or EDC. I'm a big fan of DC. Thanks Ricky.. You don't have to attend any courses or get instruction from any 'Schools' just get out and practice and it will all come together for you.. Too many schools will take your money and leave you with no more info than you would get on You Tube.